I know that you’re busy. Especially in this day and age when both parents work, or where you may be a single mom or dad doing everything yourself. The one thing that you don’t have a lot of is free time… right? So, if you’re going to implement this in your life, it’s got to be easy, it’s got to be fun (for both you and your child), and it can’t take a whole lot of free time. That’s why I created the Enlightened Kid Programs. These are REAL physical programs shipped to your front door, not just something you download onto your computer. And there’s nothing in the world like them. Everything has been custom created by me and follows the core building blocks that we covered in this webinar. 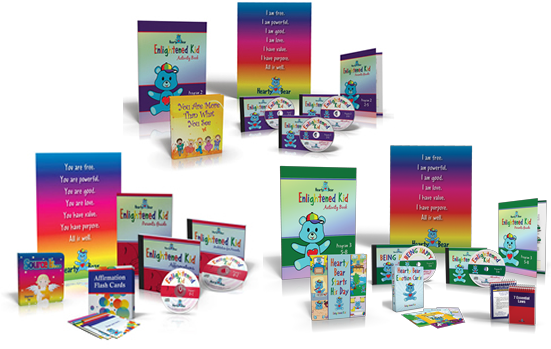 Having an Enlightened Kid Program in your home will make it so easy and fun for both you and your kids to be inspired and empowered!